It can run so fast nothing can keep up with it. 45, 55 miles per hour, and it can keep that speed up for miles. 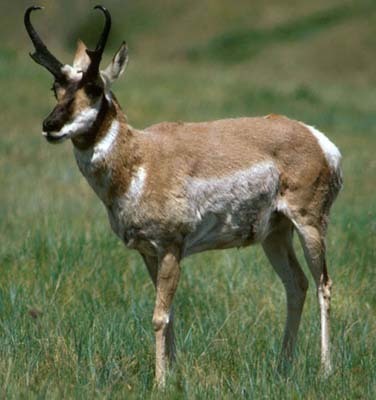 While it's often called a pronghorn antelope, it is not technically a true antelope. The pronghorn has branching horns, which it sheds annually, whereas true antelope do not. It's the fastest animal on this continent. It's rare to see pronghorns on this side of the highway - they prefer the Snake River Birds of Prey NCA to the north. It's even more rare to see, while riding around here, 1 pronghorn standing on a ridge and watching us in the wash below, (then keep running along the ridge, turning to watch us, and posing, several times), and for another 3 pronghorns to be waiting for us in Blond Cow wash before taking off on their romp. When we turned the corner into Blond Cow wash, we saw the three antelope ladies; they took off running up the wash and up onto the next ridge, frolicking along the rim in sight a while before they disappeared. Mac was quite bold. He ignored all the deer we saw today, he Stink-Eyed the cows, and he watched the pronghorns with interest. He led the way, trotting all the way up Blond Cow wash to the end, where the trail takes us up onto the ridge where the antelope ladies had gone. By the time we reached the trail - within seconds - they had disappeared, nothing left of them but their tiny hoofprints in the dust. And on the next ridge to the left, there was Arnie P. Antelope, still posing on the rim, watching the proceedings. Maybe the ladies had been looking for him. Maybe he was trying to give them the slip. He turned and ran the opposite way along the rim. The antelope ladies were out of luck today.